Thom Filicia is a talented bundle of unbridled enthusiasm. For those of you who have seen him on Queer Eye or speak in public, you will know that he is not only a gifted designer, but has a contagious positive energy. Easygoing and forthright, he makes everything seem accessible and doable. And his latest book, American Beauty, is no different – but I’ll let him tell you himself. Thom took a few minutes out of his busy schedule last month at his High Point Vanguard showroom to speak with me about his latest publication. Within a charming small town story, we happily follow along as Thom unexpectedly falls in love with a lake house in upstate New York. The renovation that follows is described step by step with both practical and inspirational information. Anyone who is embarking on or considering a renovation of their own, owes it to themselves to get this book. 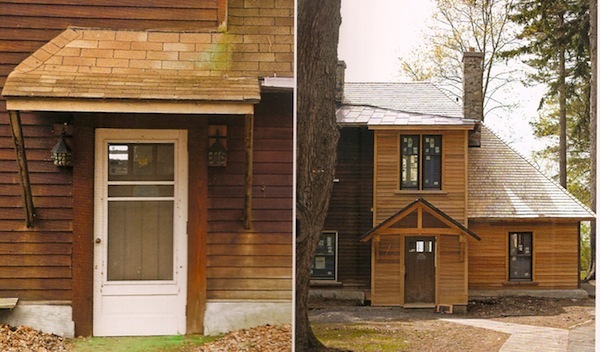 It’s not just the mechanics of construction, followed by decoration, but includes the more soulful considerations of how to respect the provenance of the house and “root the design in the materials.” The living room below contained all the elements that drove the design of the house – from the rugged stone of the fireplace to the black doors and v-groove walls. 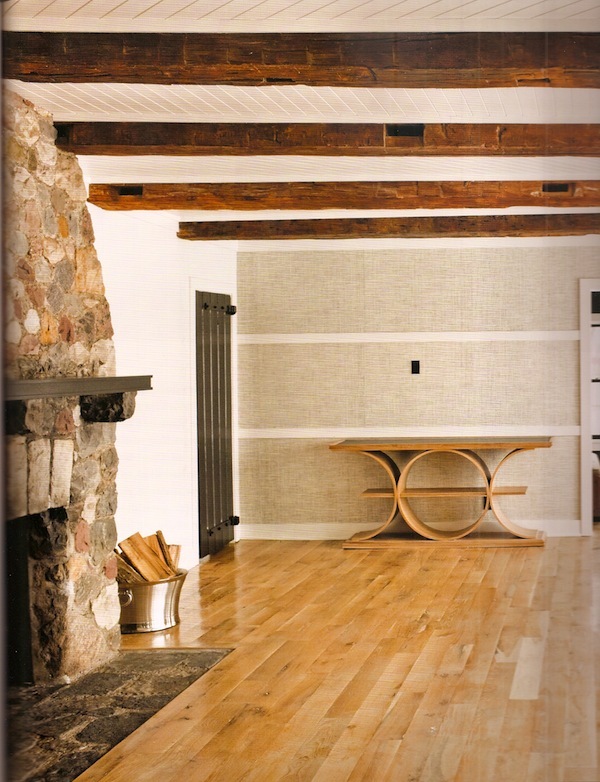 From there, Thom created a design combining rusticity with the level sophistication we are used to seeing in his work. Step by step we follow him through choices on doors, windows, floors and hardware, showing how he incorporates pieces from his collection, sometimes in new and unique ways. But it’s not just about creating a beautiful house, but how it will be lived in. Thom is the perfect representation of the new casual, striking just the right balance of refined and relaxed for the way most of us live now. 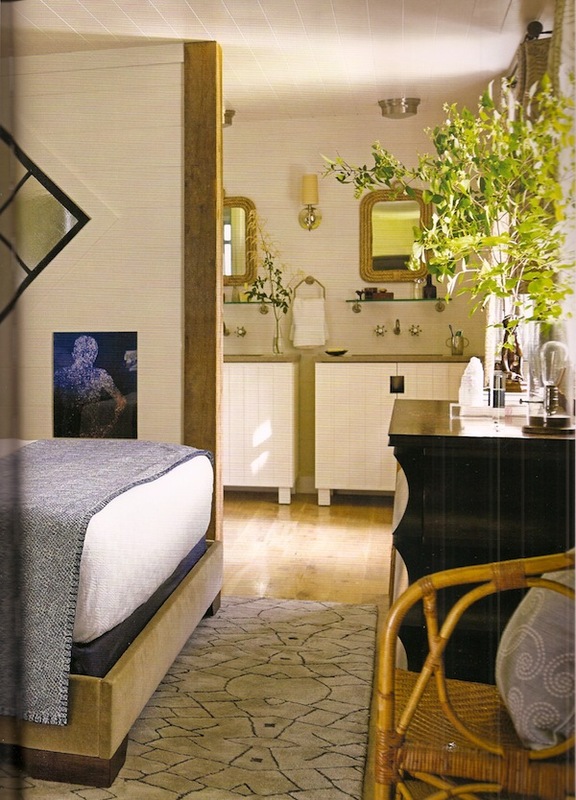 From making a guest room feel comfortable yet special for a visitor to carving out storage for a chic country bar, his design is thoughtful yet unassuming. If you happen to be in the Connecticut area on Thursday, Thom will be at the Wakefield Design Center in Stamford for a book signing from 5-7pm following a Vanguard trunk show of his collection (from 12-5 pm). It’s sure to be entertaining. And if you don’t live near by, take a stroll over to Amazon for your own copy – you’ll feel like you’re having a conversation with the designer himself. This entry posted in architecture, Behind The Q, books, design, furniture, interior design. 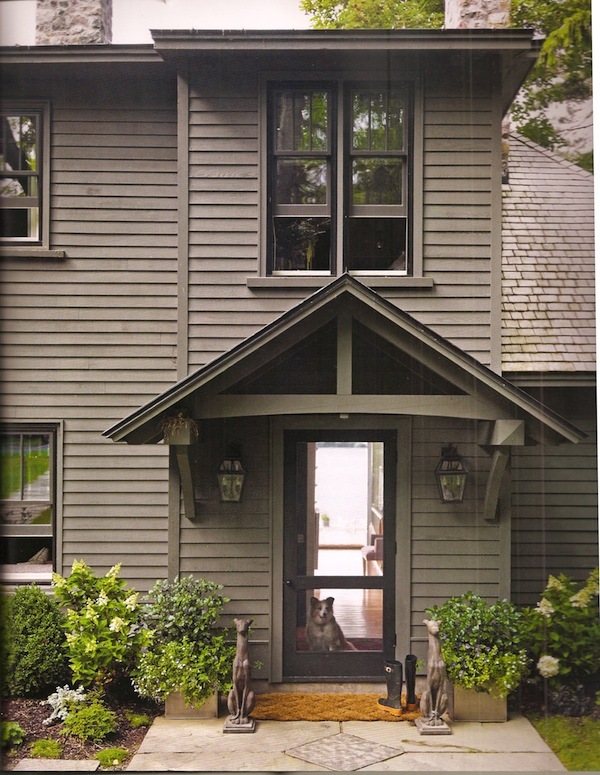 Entry Tags: Design Books, Home, Renovating, Thom Filicia Bookmark the permalink. 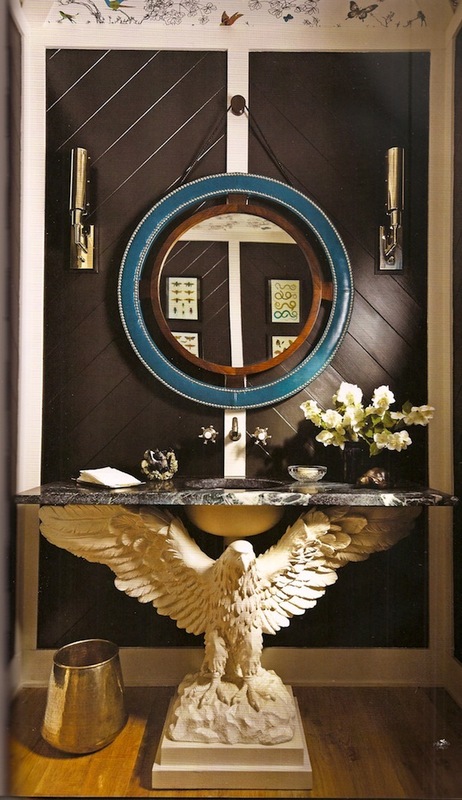 I love the turquoise leather clad mirror combined with the eagle console (vanity)–perfect pitch. I think that I’m going to be thinking about this mirror for a very long time. Thanks. As always, a lovely post on “The Q”! LOVE the console, and I want the book. One that I’m adding to my evergrowing collection! 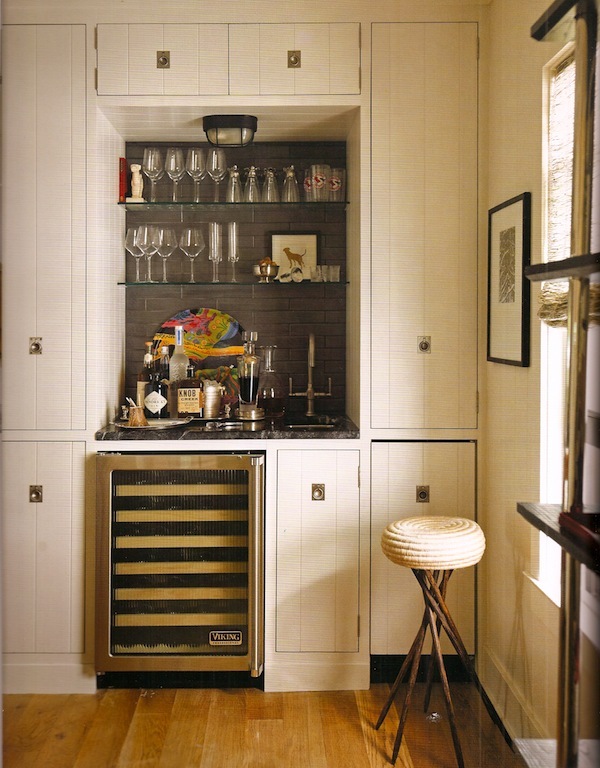 Love the bar – isn’t the stool wonderful?! Splendid! A joy to read and enjoy his journey! Just stumbled on this great article. Very enjoyable to read, and a wonderful subject. Thank you. 83 queries in 1.160 seconds.